The LDM70 Series of products is designed to allow video display terminals (VDTs) and other RS-232 devices to be connected over distances sufficient to cover any industrial or institutional complex of buildings. These modems feature a rugged aluminum enclosure small enough to mount on the back panel of VDT units, saving valuable desk and floor space. 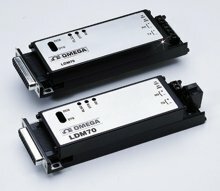 The LDM70 Series is designed for full duplex, asynchronous operation over two DC-continuity, non-loaded, twisted-wire pairs. Through special high-speed optically coupled circuits, they may communicate at data rates up to 57,600 baud. A handshake operation is implemented over the same two-wire pairs. A self-powered model and a host-powered model are available. The self-powered unit uses 12 Vac from a wall-mounted transformer, while the host-powered unit takes ±DC power from pins 9 and 10 of the RS-232 connector. The modem circuits—and, consequently, the host device—are protected from electrical transients due to lightning strikes or operation of heavy industrial equipment. Each device features a convenient Data-Communication Equipment (DCE) to Data-Terminal Equipment (DTE) switch which reverses pins 2 and 3 of the RS-232 connector. For installation and troubleshooting, each unit has diagnostic Light-Emitting Diodes (LEDs) on the transmit and receive lines. In addition, LEDs indicate valid carrier detect and data terminal ready. The RS-232 connector may be ordered as a male or female 25-pin connector. Field connection is made through a modern, solderless, screw-termination assembly. Alternatively, a convenient four-wire modular phone jack is available. 참고: Includes operator’s manual. Transformer powered units also include 120 Vac wall mount transformer.